Price: £0.50 (incl VAT) Sorry, this item is currently unavailable. Click here to receive notification when this product comes back into stock. 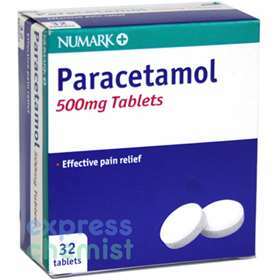 Numark Paracetamol 500mg Tablets - Effective Pain Relief. For the relief of mild to moderate pain and the symptoms of colds and flu. Directions for Use: For oral use. One or two tablets to be taken up to four times a day, as required. Half to one tablet to be taken up to four times a day, as required. Children under 6 - Not to be used unless directed by a doctor. The dose should not be taken more frequently than every 4 hours, and no more than 4 doses should be taken in any 24 hours. If symptoms persist please contact your doctor. Do not take for more than three days unless advised so by a doctor. Product code: 1074657 Price: £0.50 (incl VAT) Sorry, this item is currently unavailable. Click here to receive notification when this product comes back into stock.